GODZILLA NEO 4: Four Parter - Ben10Toys.net for Ben 10 Toy Fans! There is little hard evidence to support the legend of the battle between Susano-Wo and OROCHI, and even less concerning the legend of UTSUNO IKUSAGAMI. A relatively recent discovery of kaiju lore, its become a point of contestation over what events transpired during Orochi's destructive rampage across Japan. Grasping at the frayed edges of science dangling over this fairy tale, one theory has been postulated that the gigantic warrior Ikusagami was some sort of alien visitor that found its way to Earth and, finding one reason or another to defend humanity's primitive beginnings, defeated the monstrous serpent. However, a recent archaological discovery near the caves where King Caesar was last seen buried postulated a new theory, depicting Ikusagami as "the armor of the sun" with the phrase "Man must prove himself worthy" scrawled on a tablet depicting the giant warrior. The most generally accepted story of Ikusagami tells of how Orochi was a sort of "test," born from the Earth as well as outer elemental forces in order to serve as a trial for mankind to be the dominant race on Earth. It wouldn't be much of a stretch to state that Ikusagami was the eventual proof that we passed the test. It has been theorized that Yamato Takeru, a young prince of the kingdom of Yamato, was the one who was granted the power of Ikusagami in order to defeat the might of Orochi. But where does the story of Susano-Wo's sake fit in? It's possible that this was a ploy that Takeru used to weaken Orochi before fighting him, or it could support a hypothesis that Orochi was defeated once before, and the Spawn of Orochi had re-united into the monster for a second rampage! Be that as it may, if Ikusagami were to exist, it would be a force to be reckoned with. 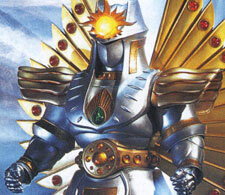 A gigantic warrior of the sun, powerful enough to stand toe-to-toe with the legendary Yamato-No-Orochi, he would certainly give any modern kaiju a run for their money. The annals of kaiju lore are constantly being uncovered and sifted through for new and exciting stories, and one that many a kaijuologist has used as a thesis or dissertation is the Spawn of OROCHI, and its addendum, the Guardians of Yamato. For many years archaeologists have been scouring for information on the "lost children" of the giant serpent, as all that were known of were Baragon, Manda and Varan. However, in August of 2008, a magnificent discovery was made; a massive underground shrine dedicated to Orochi and the legend of its children. On the left wall, when facing the chamber, elaborate paintings and carvings depict what appears to be the history of Orochi's existance and his eventual defeat at the hands of IKUSAGAMI. The opposing wall depicts all 8 of the other children and descriptions of the beasts themselves. Finally, the crown jewel of it all was a stone sphere on a pedestal in the center of the hall (beneath a menacing statue of a colossal stone god which may or may not represent Susano-Wo) that may as well have had a sign posted to it stating "this is really, REALLY important and will play a major role in events to come. Initial analysis of the perfect stone sphere reveals that, under a solid foot of stone, there is a strange object that resonates with a particular energy frequency. While G-Force scientists feverishly attempt to unravel the mystery of the stone sphere, archaeologists have managed to translate the hieroglyphics on the stone walls: BARUGARON was a fearsome monster and wielded the element of fire. Burning everything in his path, he was as vicious as any of his brethren; however, one day he and his brother BARAGON met and, supposedly in a case of "my name is too similar to yours," commenced fisticuffs. Barugaron may have had literal firepower on his side, but he wasn't as clever as Baragon. After tunneling under him, the Earth Guardian buried the fire monster in a shower of rock and stone, and, even after suffering terrible burns, manages to defeat his brother. Barugaron relinquished his life force to Baragon, granting the burrowing kaiju the power of firey breath. Of course, had the monsters fought in broad daylight, the outcome may have been much different (Baragon fights exceedingly well in the dark). Another of the Children of the Thousand-Year Dragon, SHIIGAN's power was derived from electricity, and brutality to match. The insect/reptile hybrid, according to the Orochi ruins site, met in vicious mortal combat against MANDA, the Water Dragon. The coils of the serpentine monster were an obviously easy target for the blades of her sibling, but Shiigan's lightening power was both compounded and complicated by the waters of Manda's environment. The power of Manda's water manipulation eventually overpowered even Shiigan's nasty disposition, who was forced to give up his life energy to her sister, granting her the power of the Thunder Spark. 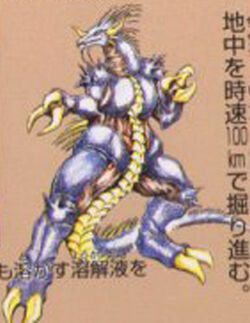 Interestingly, Shiigan bears a odd resemblance to another legendary kaiju, the cyborg GIGAN. Whether or not this has deeper implications or simply a result of convergent evolution (see: big fat coincidence) remains to be seen. A decidedly hideous child of the mighty Orochi, VAGNOSAURUS is a living mass of poison and venom; a walking biological weapon. This snarling she-beast met her demise at the hands of her ferocious brother VARAN. It was a very even match, as the legends etched on the cave wall tells us, with both creatures badly bloodied and exhausted. It wasn't until Varan finally managed to cast her into the sky with his wind power, then smash her into a mountainside that he gained her extremely useful acid-like bodily fluids to bout against future enemies. 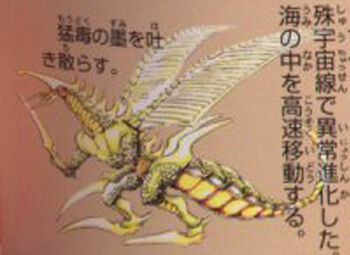 Vagnosaurus was the last of the Orochi spawn, until 2004, to have its spirit condensed into the Orochi Amulet, which served well to supercharge Varan in his battle against GHOST GODZILLA. The last two monsters, BALKZARDAN and JYARUMU, are still having their tales of drama and destruction translated.